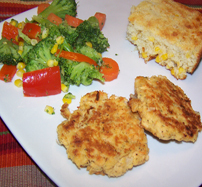 My family loves these tasty salmon patties. They go well with most any side dish. The best part is they are so quick and easy to make! In a a large bowl combine all ingredients. I usually mix it with my hands like you would meatloaf. Shape into 3-4 inch patties. Fry in a skillet with 1/2 cup oil (vegetable, Canola or olive oil). Cook over medium heat until browned on both sides. Place on a plate with paper towels, serve hot. Makes 8 patties.